Success after success for Japan, in Panagyurishte time and time again contrary to the status quo; as the quarter-final matches in the Men’s Singles event at the Seamaster 2017 ITTF World Tour Asarel Bulgaria Open came to a close on the afternoon of Saturday 19th August, it was the reverse scenario. It was the land of the setting sun, not the rising sun. Leading names in the guise of Germany’s Dimitrij Ovtcharov, the top seed and Nigeria’s Quadri Aruna, the no.3 seed, both appeared successful against Japanese qualifiers. Victory for Kasumi Ishikawa meant that of the five titles contested to date, all had finished in Japanese hands. Earlier in the week, Mizuki Oikawa and Mizuki Morizono had won the respective Under 21 Men’s Singles and Under 21 Women’s Singles titles; earlier on the concluding day of action Jin Ueda and Maharu Yoshimura, the top seeds, had beaten India’s Soumyajit Ghosh and Sathiyan Gnanasekaran, the no.5 seeds, to reserve the top step of the Men’s Doubles podium (11-13, 11-7, 11-4, 6-11, 11-5). It was only in the contest that brought the whole tournament to a conclusion that gold did not finish in the Japanese collection. Germany’s Dimitrij Ovtcharov beat Kenta Matsudaira in five games (9-11, 11-7, 11-4, 11-9, 11-9); a contest where just as in the Women’s Singles final, the top seed beat the second seed to claim gold. The highest step for Dimitrij Ovtcharov meant he collected his eighth ITTF World Tour Men’s Singles title in 14 final appearances. Also he secured his third of the year. In February he won in India, in June in China. Similarly, Jin Ueda and Maharu Yoshimura added to their China success of earlier this year and, by emerging successful Panagyurishte, collected their third career ITTF World Tour Men’s Doubles title as a pairing. In 2013, they had won on home soil in Yokohama. Meanwhile, for Kasumi Ishikawa it was her seventh ITTF World Tour Women’s Singles title in 11 finals and her second in Bulgaria; she won in 2015, likewise beating a Japanese adversary in the final. On that occasion she accounted for Ai Fukuhara. Furthermore, it is the third time that she has won both the Women’s Singles and Women’s Doubles events at an ITTF World Tour event. She completed the feat in 2011 in Chile and three years later in Russia; on both occasions she partnered colleague, Sayaka Hirano. Play in Panagyurishte concluded, attention now turns to Olomouc. 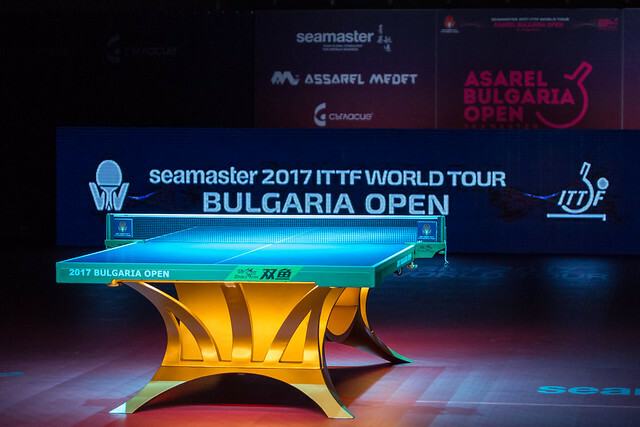 The Seamaster 2017 ITTF World Tour Czech Open commences on Thursday 24th August being preceded by the qualification tournament which commences on Tuesday 22nd August.